What is the structure of Papillon Haven Rescue (“PapHaven”)? PapHaven is a 501c3 non-profit organization. There are no paid employees or officers. All members are volunteers. Many have regular employment and families and volunteer their time as available. Daily Operations are handled by a Management Group consisting of: Directors; Advisory Board; Region Team Leaders; and Region Team Leader Coordinator.Requirements for an IRS 501c3 may be found on the www.IRS.gov website. PapHaven is organized around a Board of Directors with an Advisory Board to the Directors. Directors are Officers of the Corporation. Advisory Board Members are nominated by the members and approved by the Directors for terms as stated. Policy and over all Procedures are set by the Directors with advisement of the Advisory Board. Conflict issues are resolved by the full Board. Do rescued dogs have to be pure breed Papillons? 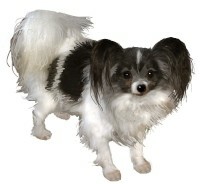 PapHaven rescues pure breed Papillons and also Papillon mixes with Papillon characteristics, of all ages and sizes. We do not take aggressive or biting Papillons. PapHaven does not buy Papillons from auctions, commercial breeders, or any individual. Where does PapHaven get the rescued Papillons? PapHaven receives Papillons from shelters and other rescue groups, when needed. Fees may be paid to shelters and other rescue groups if medical or vetting is/has been provided, with the approval of a Board Member. Some Papillons come from Owners who no longer can keep them for a variety of reasons. Some come from Court Confiscations of hoarders or sub-standard breeders. Why does PapHaven charge an Adoption Fee? PapHaven charges an Adoption Fee to help defray the cost of veterinary care, regular health maintenance; and foster care. The Adoption Fee is to help defray expenses for ALL Papillons and/or Pap mixes in our rescue and re-homing program. Some Papillons arrive with health issues that cost a great deal to heal; others do not. Normal medical care is provided for any Papillon in need. However, extreme and expensive emergency care will depend on available funds and need approval. How does PapHaven acquire Funds for the operations of the organization? Funding for PapHaven is wholly dependant on donations; adoption fees; and fund raising activities by the members. Will PapHaven take dogs that cannot be adopted? PapHaven is not a sanctuary for terminally ill, dangerous and/or aggressive dogs.